The PBOC has been guiding money market rates higher since Q3 2016 to close the offshore/onshore yield differential with markets in Hong Kong, discourage capital outflows and maintain stability in the yuan exchange rate as the HKMA raises rates in coordination with the US Federal reserve. Regardless of the deleveraging signal that higher money market rates represent, the overall debt build-up in the economy is continuing. Loans to the household sector rose by 64% in 2016 and have risen by 75% so far this year. The total stock of household loans is up 25% since February 2016, while the stock of NFC loans is up only 8%. This has moved the household per capita debt-to-income ratio above 100%. The corporate sector is carrying upwards of $18 trillion in debt, and in a H1 2016 Reuters survey, 25% of companies didn’t have sufficient profits to cover debt servicing obligations. The central authorities are guiding banks to continually roll over loans falling due. Although the banking system is insulated from international financial markets, banks are holding very large amounts of debt, and the overall financial system has an NPL ratio above 22%. The real estate sector is the most exposed to rising rates, and Chinese developers were carrying $6.2 trillion in debt as recently as 2014. Developers are exposed to higher US interest rates, having raised debt through international capital markets in Hong Kong and Singapore. The property industry is a “leverage or lose” industry, and most developers need property prices to continue rising in order to remain in business. Many China watchers have expressed the view that inflation would eventually run higher, forcing the authorities to raise interest rates, precipitating a spate of defaults in the heavily indebted corporate sector. So far, the authorities are using a tactical approach of raising money market rates, while leaving the economy-wide benchmark rate unchanged. So far, slightly higher money market rates are already putting pressure on smaller banks. This could still be the year when the State’s implicit guarantee of corporate and bank debt is called into action. The yuan exchange rate has been stronger since early January, as the large state-owned Chinese banks coordinated their USD selling efforts with the PBOC engaging in derivatives transactions. With these derivative transactions, the PBOC pledges to buy the yuan at a forward rate that is better than what the market is offering, pushing the non-deliverable forwards (NDF) rate artificially higher. As the offshore CNH fell below 6.90 yuan per USD, the NDF rate remained above 7 tuan per USD. 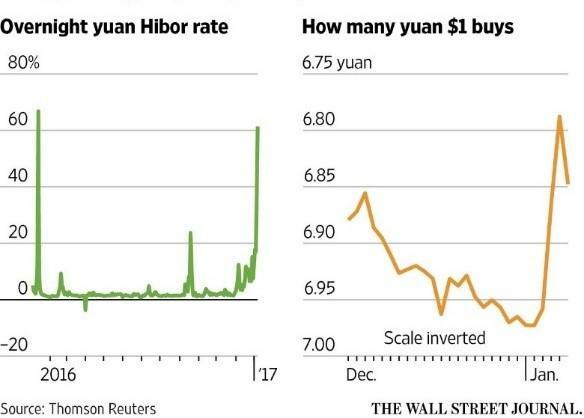 The chart below, from the WSJ in January, shows the spike in shibor and corresponding drop in the exchange rate. A series of these transactions is likely to have lessened the drag in foreign exchange reserves in February, with SAFE reporting an unexpected rise. Supporting the yuan with these moves prevents the PBOC from having to sell dollars, preserving more reserves. The signal that this is not very successful is that even though the exchange rate has appeared to stabilise, the forward rate still remained above 7 to the dollar, with the market expecting further depreciation. The authorities reported through state media outlets that moves were made against scores of underground banks and brokers offering foreign exchange services. Various local authorities reported that they had received permission to open “green channels”, gaining access to internet accounts and electronic records to track illicit bank accounts used to move cash offshore. SAFE reported that it shut down 6 underground banks, with one “ant mover” in Shenzen responsible for moving 50 billion yuan ($7.3 billion) of currency and holding over 6,000 bank accounts across various Hong Kong financial institutions. Likely spooked by the sharp move in the exchange rate, Chinese SOEs unwound their sell transactions in the face of sharply higher shibor rates and an interbank lending market that was seeing a dearth of dollar liquidity after aggressive draining efforts by the PBOC. Regardless of the apparent claim in the exchange rate, considerable depreciation pressure is building up. The exchange rate responded in lockstep with rate rise signals from the US Federal Reserve even through the dollar has weakened this year. Chinese and Hong Kong banks and brokers are reporting that client demand to invest savings and cash offshore has increased after the authorities implemented capital controls. Yim Fung, chairman of Guotai Junan, the Hong Kong brokerage, said in an interview with Caixin that, “The demand to move some wealth offshore, to maintain and increase the value of it is very strong among clients, regardless of whether it is a state-owned company or a privately owned one, or if he or she is a high net worth individual“. The Chinese SOEs and semi-SOEs who are the main sellers of the yuan are looking to protect the US dollar portions of their asset bases. The authorities have also cracked down on foreign corporations using free trade zones and transfer pricing agreements to move cash offshore. Data showed that the economy stabilised in Q4 2016, and data readings so far this year show that economic momentum has been sustained, with Independent PPI and PMI readings showing a sustained recovery. China’s foreign trade surplus narrowed by 9.1% in 2016 to 3.35 trillion yuan as the authorities spent reserves to support the exchange rate. 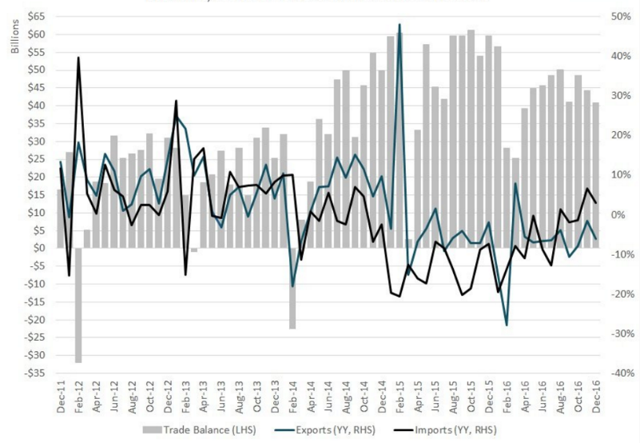 Endangering the trade surplus to support the yuan doesn’t make sense for the country in the long run. 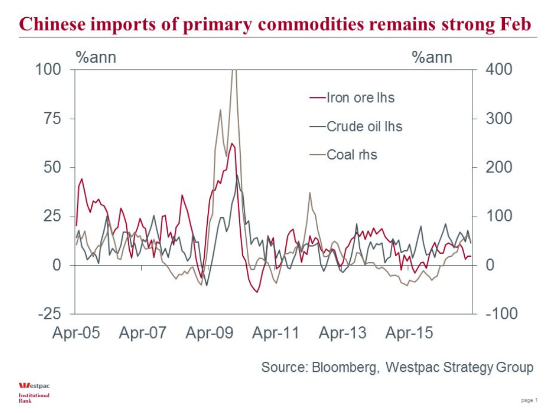 The recovery in the economy has been driven by continued strong imports of key commodities – crude oil, iron ore, and coal since the second half of 2016. Government spending on infrastructure development and a hot real estate market were central to the recovery in growth in 2016. Real estate contributed 0.6% points to GDP growth in 2016 (0.5% points more than in a normal year), yet the authorities were vocal in their efforts to curb the rapid price increases in Tier 1 cities. 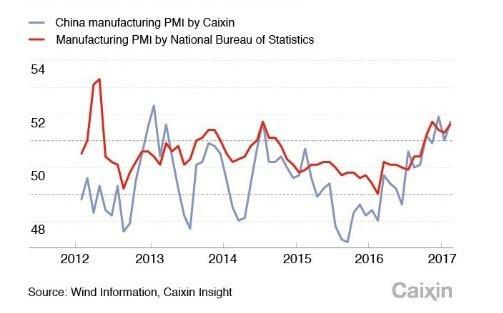 Ha Jiming, vice chairman and chief investment strategist at Goldman Sachs’ China Investment Management Unit, estimates that without the contribution of real estate and infrastructure spending last year, GDP growth would have been 4%. Historically, the authorities have had a grip on consumer price inflation through their control of transportation and utility prices, but control of producer price inflation has proven more difficult. Global prices for coal, steel and iron ore picked up strongly last year on the back of stronger demand and production cuts in China. Greater-than-expected capacity closures, production cuts, and limits on total production days in the coal and steel industries, and a rebound in real estate and infrastructure development, all combined to produce a growth sweet spot for the economy. However, there is widespread agreement that on the ground, the authorities have not dealt with the overcapacity problems in these sectors, which contributed to the fall in global commodity prices in 2015.